When Cecilia Gimenez, an untrained art restorer, took it upon herself to freshen up Elias Garcia Martinez’s nineteenth-century Ecce Homo fresco, in Spain, she transformed Jesus into a weird, hairy monkey. The image has become so popular that a bakery in Madrid is now using it to decorate its crêpes. I’m always looking for ways to work olive oil into foods that traditionally would require butter. Many of the pastry crusts I use for savory tarts and even some sweet ones consist of just olive oil, salt, wine, and flour. It’s amazing how flaky they cook up. I make olive oil biscotti and cakes that are, to my taste, more tender and lighter than butter-based versions. I also use olive oil in crespelle, Italian crêpes. The texture is lovely, and they’re much easier to work with than butter-based crêpes. Olive oil crespelle are a perfect wrapping for seafood or Mediterranean vegetable fillings such as eggplant or the roasted peppers I’ve chosen for this recipe. Don’t be afraid to make crespelle. They’re not that hard, especially with this olive oil batter, and once you’ve got it down, you can improvise with fillings and sauces to your heart’s content. Getting the rhythm down when you’re cooking crespelle always takes a few minutes. You need the time to regulate the pan heat and come to understand just how much batter is right to thinly cover the pan. You’ll produce a few lumpy, folded, truly messed-up-looking crespelle before you hit your stride. Don’t worry. That’s just the way it is. For the crespelle batter, put all the crespelle ingredients into the bowl of a food processor, and pulse until very smooth. The result should be the consistency of thick cream. If it’s too thick, add a little more milk. Pour the batter into a bowl, and let it sit about 45 minutes before using (this will relax the gluten a bit, so you get a nice tender crepe). To cook the crespelle, I used a 7-inch omelet pan, but if you’ve got a proper crêpe pan, a little bigger or smaller, use that. Any small sauté pan will do the trick. With these olive oil crespelle, I never find sticking a problem, so you don’t need a non-stick pan. Put the pan over a medium flame, and let it heat up. Pour in just enough olive oil to coat the pan. Pull the pan from the heat, and ladle in a bit less than a quarter cup of batter, tilting the pan quickly in a circular movement to spread the batter. (You’ll get the hang of it. The first few usually don’t come out too well. Once the heat is regulated and you get the feel of it, trust me, you’ll find it fairly easy.) Let the crespella cook just until you notice it coloring lightly at the edge. Then shake the pan, moving the crespella away from you, and slip a spatula underneath. Give it a fast, confident flip. If it folds up a bit, just straighten it out with your fingers (these things are a lot sturdier than you’d think). Cook on the other side for about 30 seconds, and then slide onto a big plate. Make the rest of the crespelle the same way, adding a drizzle of olive oil to the pan each time. Stack the crespelle up on top of one another (they won’t stick, I swear). If you like, you can refrigerate them until you want to assemble the dish. Mix the ingredients for the ricotta filling together in a big bowl. In a medium skillet, heat 2 tablespoons of olive oil over medium flame. Add the red pepper slices, the garlic, a pinch of sugar, salt, and black pepper, and sauté for about 2 minutes, just to finish cooking the peppers and coat them with flavor. Take about a quarter of the peppers out and place them in a food processor, including any juices that are left in the skillet. Work them into a purée. Add the chicken broth and the cream, and give it a few more pulses, just to blend everything. Season with a little salt. Transfer this sauce to a little bowl. Lay the crespelle out on a work surface. Cover each one with a layer of the ricotta filling, leaving the ends of the crespelle uncovered. Now place a piece of prosciutto cotto and a few slices of the roasted peppers on top. Roll them up, and arrange them in a well-oiled baking dish that will hold them rather snugly (you can use two dishes, if that’s more convenient for you). Drizzle the pepper sauce over the crespelle, and sprinkle on the grana Padano. This sauce is not meant to cover the entire dish. It just provides a little flavor boost and moisture. Bake until bubbling and lightly browned at the edges, about 15 minutes. Garnish with the thyme sprigs. Serve hot. No need to let them rest. They’re quite firm. I like them served with a simple winter salad of mixed chicory-type lettuces, such as frisée and endive. Very nice entry and an interesting take on the old standard crepes…I must have made a million crepes in day. Seriously. I was often required to make 200-300 a day, all while tending my regular station at the broiler. You make it sound so easy. Your recipe looks delicious. Good work! Sounds luscious. What do you think about stacking up the crespelle like a layer cake rather than rolling them individually ? Marieta, Totally doable. Done in France and Italy. Very pretty too. I’ve also made lasagne like creations with crepes. All good. And you can easily leave out the prosciutto, if you like. 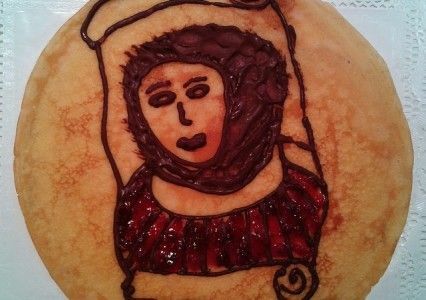 Beautiful recipe.I would need a little practice.The image on the crepe dosn’t look like a hairy monkey or Jesus! it looks like a nuns wimple. erica, my daughter is on a gluten-free diet. would there be a flour that could be successfully substituted for the wheat flour in this recipe? she uses almond & coconut flours in many of her recipes. what do you think about using one of those? Zingara, I don’t have a lot of experience with gluten free flours. I’ve served gluten free pasta, made from various things, and have been unhappy with the texture of all of them. The thing about crepes is that they get their silky, tender quality from gluten and also from egg yolks. I’m sure your daughter knows some of the gluten free blogs. Maybe she should write to one of those-or check their archives for crepe recipes. I know in Brittany crepes are made with buckwheat, which is not technically a wheat and has no or very little gluten, but I believe it’s usually mixed with a bit of real wheat flour to hold the crepes together. Gee I hope she doesn’t stop eating olive oil. That would be tragic. I have kids, and there were many times over the years when I would have gladly traded them for a bottle of olive oil — _any_ olive oil. Over time they turned out okay, fortunately, just as I imagine your delicious-sounding crespelles will (if I practice making them, that is. Can’t imagine I’ll get that right on the first go-round either). Hot olive oil can be poured into kid’s ears, even if they don’t have an infection. My grandmother used to do it to my father. It really calmed him down. Too bad you didn’t know this useful Italian child rearing technique at the time. Crepes are a lot easier than kids. Oh my, here I was all set to comment on this lovely post, and now you’ve sidetracked me with mention of the olive oil cure. Well do I recall having a bit of warm olive oil poured into my ear when I was a kid. In our home that treatment was the first line of defense when ear trouble struck. If the oil did not do the trick, then Dr. Cobley was summoned. Frankly, even mention of the good doctor and a house call was often enough to get a child to reconsider the degree of the severity of the pain. Thanks for the reminder. Thank you also for this wonderful recipe. I am anxious to try it. Being of Abruzzese descent, I have, in the words of the late Anna Teresa Callen “… a predilection for crepes.” I am particularly intrigued by your addition of olive oil to the batter. I have never done it, and I look forward to the taste test. Somehow crespelle have gotten such a bad rap; everyone thinks they are terribly difficult to do. I think we need to remedy that. What say you? Thanks again. This sounds wonderful. My parents, in their attempt to be modern New Yorkers, wouldn’t be caught dead doing something as rustico as filling our ears with olive oil. That ended with my father’s generation. Worth bringing back. Maybe I’ll try it on my cats. Crepes were not something my grandparents ever made. My mother started making them at some point in the late 60s early 70s from a recipe in Gourmet. The olive oil substitute was a whim of mine and it worked out nicely. They’re much easier to handle than butter crepes. They have a different aroma, as you can imagine, making them best for savory fillings. Give them a try. As “California” as my parents and extended family went when they rolled into the sunshine state, some things came along. I actually remember the warm oil in the ear as having been quite soothing, although I never enjoyed the process of instilling it. My grandmother, Angela Barra Crocetti, was into the olive oil cure for more than ears – she used it on hair too. What can I say – it cut down on the frizz. But most awesome was the treatment reserved for the child who complained of a stiff neck. A clove of garlic, gently warmed in a skillet with a touch of olive oil was neatly tucked into a white linen napkin. Said napkin was then wrapped about the offending neck. No jive. Needless to say, one though long and hard before complaining of a stiff neck. How’s that for your daily dose of rustico? Oh the garlic. Maybe they were actually trying to dissuade gentlemen callers. Although any gentleman with a love of garlic could have a sniff of my neck.